The annual Memorial Day Weekend air show is back and expect great performances! Senator Charles Schumer recently announced the United States Air Force Thunderbirds are returning to Jones Beach. The last time they performed was in 2011. You can also expect to see the U.S. Army Golden Knights, U.S. Navy Parachute Team, “The Leap Frogs,” and the USMC MV-22 Osprey aircraft. Civilian air teams like the GEICO Skytypers, Misty Blues All Women Skydiving Team, Red Bull Air Force and more will all be making performances as well. Bring some blankets, beach chairs and come early so you get a great spot to enjoy the view! 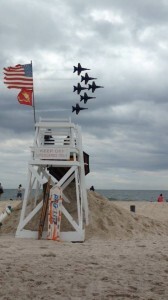 The Bethpage Air Show at Jones Beach takes place May 23 and May 24, so you have two opportunities to check out the action. Join in the fun of the Long Island Ducks games at Bethpage Ballpark on May 23. 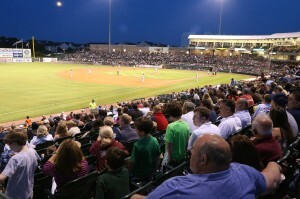 The Ducks will be hosting the Camden Riversharks in a double header; one at 1:05 pm and the other starting at 6:35 pm. The night game will include a jaw dropping fireworks extravaganza by Pyrotecnico! Take the family or your friends for a great time and one of the most awe dazzling fireworks display. From television to sports games, Pyrotecnico has been creating impressive light displays, they’re sure to make the Ducks games one of the most exciting Memorial Day events on Long Island. Pay tribute to those serving as the U.S. Navy, U.S. Marines and U.S. Coast Guard host Fleet Week New York with demonstrations, stunts, parades and band concerts. 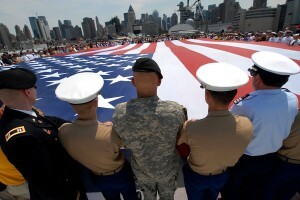 The military branches are stationed all over Long Island, New York City and New Jersey, so don’t miss your opportunity! Fleet Week begins May 20 until May 26. Head out to Eisenhower Park for a U.S. Navy and U.S. Marine aviation demonstration, which includes Navy helicopters and personnel and the Marine’s MV-22 Osprey, CH-46E Sea Knight and the AH-1W SuperCobra. Travel over New York for the weekend to see some of the best military displays around, you won’t be disappointed. No matter what you do this Memorial Day Weekend, make sure it’s a great time. There’s plenty of town parades and events. Head out to some Memorial Day parties and take the time to pay tribute to our fallen soldiers who have fought for our freedom. When celebrating with these Memorial Day events on Long Island, make sure you’re safe. Ollie’s Taxi & Airport Service can take you to any event, parade or party. Make a reservation online or call us at a location near you and have a great Memorial Day Weekend!